Learn more about Kornblit Tours! 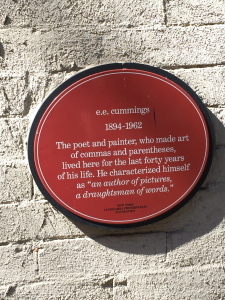 in anticipation of our upcoming kornblit walking tour to greenwich village that features poets, writers, political activists, and a host of other legendary sites; i will write this blog post in all lower case letters, as a shout out to the non-conventional trademark that e.e. cummings has made famous. steve kornblit likes to quote e.e. cummings’s more romantic side. while standing in front of his former home in patchin place, he will recite this poem by e.e. cummings to our group, (but he is really speaking to me) .…. © 2016-2099 Pine Group, LLC. All rights reserved.